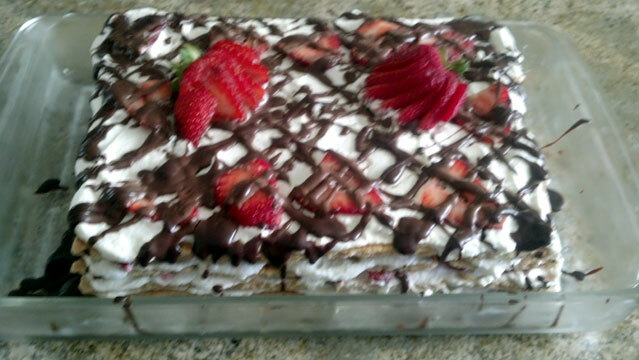 Today I made my first Icebox Cake. It not only looked and tasted amazing but it was really easy to make. Fresh strawberries are the star of this dessert but I think it will also work with a mix of other fresh berries as well. What's really great is there is no baking involved which makes this the perfect hot weather dessert. As the ingredients chill in the fridge they meld together into a creamy cake like texture that I thought reminded me a lot of a cream puff. Wash and hull the strawberries and slice them thin. Leave a couple out for the top of the cake. Start whipping 3 cups of the cream. As it thickens add the confectioners sugar and vanilla and continue to whip until stiff peaks form. Spread a thin layer of the whipped cream in the bottom CENTER of the pan. Place 6 graham crackers on top of the cream, 4 side x side and 2 across the top, this is your foundation. Spread a layer of whipped cream on top of the crackers, then a single layer of the berries. Repeat until you have 4 layers of graham crackers excluding your foundation. Spread the remaining cream on the last layer of graham crackers and dot the top with a few more berries. Heat 1/4 cup of whipping cream over med/low heat until bubbles start around the edge. Pour the heated cream over the Dark chocolate and let it sit for a minute the whisk until smooth and creamy. Drizzle the ganache over the cake, top with those extra berries you saved. This recipe makes a decent size dessert as you can see in the picture. You can certainly adjust the ingredients and the layout of the graham crackers to make a larger cake if you want to. You can also use a smaller pan if you don't have the 9x13.